In the process of professional music recording, the work must go through many tweakings. I start out laying basic lead vocal, acoustic guitar played with a click track. I take the rough draft home and work on harmony. Then I get ideas for motifs, which I then give to my lead guitarist, bassist and drummer. We all meet for a recording session. Then comes the artsy part. My producer-engineer and husband Mark, sit together and listen back to the tracks. We listen carefully for any notes I sang flat or sharp, any bad bass notes or any dissonance. We take home the track again, listen and continue to fine-tune the song. By the time it’s ready for mastering, we have tweaked and tweaked until the mixes sound radio ready! It can be an arduous process, but joyously rewarding. I’ve learned so much, recording all of six original CDs and three cover ones. After over twenty solid years of professional recording, I can say I’m a veteran songwriter-producer but still always evolving to ever higher musical heights. Thankfully, my hunger for excellence has spilled into the area of my personal spiritual growth as worship leader-songwriter, journalist and soul sculptor desiring to see glorious transformation within the body of Christ. Upon awakening each morning, I start meditating about Father God searching my heart, testing my anxious thoughts and showing me if there is any evil. Psalm 139:23 &24. I ask Him to help set a guard over my lips. Psalm 141:3 I daily have to yield and give Him permission to tweak me, my actions and even my deepest unconscious response. Why am I so concerned? The hour is late the world is getting darker and more evil by the day. Atrocities beyond the most barbaric horror movies ever created are occurring everywhere. During my prayer time, I’m even more aware of the lateness and urgency f the time I’m in and how I must be salt and light. You and I are ambassador of peace and reconciliation and a king and a priest! In one of my earlier blogs, Sloppy Agape or Penchant for Priestliness, I focused on living an excellent life in Christ. I hope Tweak Me zeroes in about the reality of the demonic realm violently belching out profound evil attacks worldwide and in every area of peoples lives. This demonic assault is so powerful, unless God’s people get it together in unity, we will be overcome by death and destruction. This is not to scare anyone but to show how we must approach the demonic dilemma. We must be unified in love and fit for the master’s use. It has grieved me to hear about so much friction, strife and dissension amongst my brethren. Being brought up in a multi-cultural family, a hard-working, gregarious Puerto-Rican father and stoic, moody German mother, was a cause for many difficult times for my three sisters and I. It was here in family that I learned how important diplomacy, a desire to quickly forgiveness is essential to be emotionally and spiritually at peace. I willingness to keep communication lines open is golden! I want to be closer to God and be the expression of his kindness, patience, mercy and grace. Rather than just read God’s word, I desire to meditate on it, so it can become a beautiful part of me. I’ve learned that it’s not enough to just read the word, but to ask Holy Spirit to bring it to life in our spirits. Here is where the transformation occurs! Jesus discourse in the Gospels was penetrating and not easily forgettable. His words cut like a knife as he spoke in parables or true events with a conviction so strong, many were transformed forever! The framework of family and society is so fragile and dependent upon us abiding in Him, (the vine) that without our meticulous interaction and intervention, society will cease to exists as we know it! We must work hard to overcome rivalry, impatience, frustration, strife and anger by asking for God’s help. We must discipline ourselves to daily by gazing into the Holy Spirit mirror. Only then can we receive the help we need to be the overcomers and transformers of our world! Addressing confect has always been one of my weak points I hate confrontation because usually it is with someone intent upon imposing their will or perspective on mine and usually ends up with hard words said.. Sometimes even just angry, closed body language and angry facial grimaces make my stomach ill. The past few days while going about my usual mundane chores, I kept thinking about the phrase… ..every idle word .I knew God wanted me to elaborate on how our speech affects our lives and the lives of all in our world. .All week, friends and loved ones ask me to stand with them in prayer about their frustration with their chaotic family unhappy spouses and kids and unfruitful ministries. Sins of the flesh are usually at work. I grapple with my own share of issues with my husband that we must work out together. Sometimes during an argument with my husband, (thankfully we don’t cuss each other or disrespect each other), but his body language and disrespect may anger me. My voices gets high and he will walk right away, refusing to talk with me unless my voice gets lower. After the argument, we wonder what happened. I always soul search and ask God to show me how I contributed negatively to the situation. With that in mind, I know that communication entails a delicate blend of respect, self-control and patience. We have much work to do together to navigate the atmosphere of resolving our hard issues. One thing for sure, we both know that we must forgive and hug each other sincerely, so we can both go to sleep with a clear conscience! Resolving conflict and forgiving should enter the equation whether we have a conflict with our spouse, children, co-workers or neighbors. Holding on to anger will never set us free to receive the peace and blessing father has for us. We should always soul search to see if there was something we said or did that would have positively resoled the issue. Sometimes our lives or relationships are unfruitful not because of doing bad things but because of not doing the right thing! I love Joyce Meyer’s ministry because she focuses often on teachings about cultivating fruitful love walks. I love to compare the concept of our love walk with my planting of my vegetable garden this past summer. There are very deliberate things one has to do to have a garden that produces lush produce. One can’t expect to just plant the seeds and forget about them. First came the tilling of the hard, lifeless soil, then adding and mixing organic fertilizer , more tilling and then rest and wait. After a few days, the small seedlings growing in small containers were transplanted carefully into their place in the soil. Certain plants would grow and take much space so they had to be positioned with that in mind so they wouldn’t overcrowd those plants which took less room. To the avid gardener or professional farmer, nurturing their crop is a prized and precious endeavor. We should look at it in the same we do growing fruitfully in God’s vine! The power of love is the fortifying agent we produce, (after learning spiritual warfare skills.). What good is being an loving child of God everyone gets along with, but you’re bound,, miserable and fearful and you can’t help anyone be set free!? Responding positively in faith when faced with trials, cris and tragedy is what Father desires in his people. Perseverance and humor assuages the burden of grief and difficult times. Jesus gave a serious rebuke that every idle word we speak shall be revealed on the day of judgement. After an argument, we may say, “Oh, I didn’t mean to say that.” But it came right out of our hearts. Jesus said, “Out of the abundance of the heart, the mouth speaks.,” Luke 6:48. Jesus says that a good tree is known by its good fruit. If we are bearing good fruit then good things should come from our hearts to our mouths. I believe more pastors, teachers and prophets should be teaching their people about the necessity fo bearing good fruit and abiding in the vine to illuminate the glory of our Father! I pray the body of Christ meditates on the concept of the becoming that beautiful tree planted by the waters that bears fruit even in the desert and famine times. Let us not live our lives casually, but purposefully. Let’s refrain from saying aloud things that ought not be even thought of! In participating in the building of of Father’s kingdom, we must be very precise and focused. Let’s fine tune our reactions and habits of communication and ministry buy putting off contentious, strife, envy, wrath, pride critical and legalistic spirits. Whoever names Christ as their savior must put away (and be aware of the tendency to have) iniquity. Strife is a real killer of unity in the body and good relationships and we should avoid strife at all costs. We are called to live at peace with all men. God’s sons and daughters must be perfect…perfect as Father is perfect. Perfection in this context is not the sense of never being wrong, making mistakes, having a strong disagreement with someone, but having an awareness and desire to be the best we can even in our thoughts, speech and actions. Let us focus on nurturing our spiritual garden, our hearts, with wonderful and edifying things. To close, I wanted to share on my recent meditating of Rev 20:12 , I’m humbled by reverential fear reading about the Bema Seat . It has caused me to remain vigilant and watchful for demonic attacks which would make me soppy in my love walk. 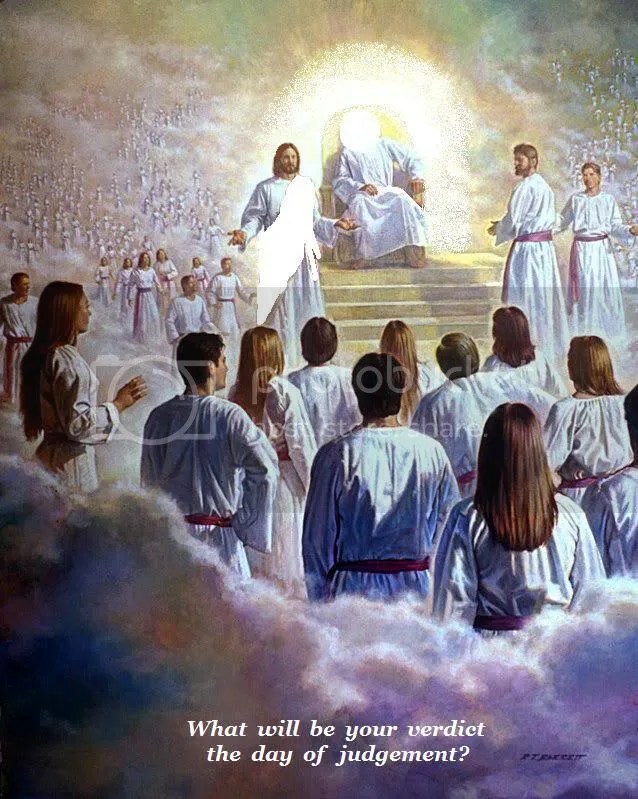 The scene of the Bema Seat on Judgement day for all people reminds me that our whole lives will be wrapped up in a nutshell within the pages of our book of life. There will be no time to take back anything we’ve done or make excuses to God. Let’s seriously meditate on being prepared, in true intimacy with Father-Christ and having our relationships in order. Let’s put away all bitterness, resentment, unforgiveness and/or hate. Imagine, beloved, your own book in heaven. I pray that you and I will have few recorded negative incidents to be ashamed of. I pray that now, while we still have a little time, that we will start today tweaking our love walks and be fruitful in every good work! 2 Tim 2:21. Let us not say evil things about our president, wish that murderers and rapists all die or blast TV pastors and evangelists and their past indiscretions. We need to pray fervently that all men may receive Christ. Paul and Moses were both murderers, Two of the most infamous Muslim terrorists had a Damascus experience and received Christ as Savior and Lord!. We don’t know which enemies now are our friends and brethren in the future! Father, help us to speak life-giving words and not look for the faults in others. Help us to discipline ourselves in meditating on how to have good fruit and to tweak our love walks even if we get along with everyone. Help us to have an attitude of gratitude for all people and to find the good in everyone. Help us also to pry for our enemies and those who persecute us because we don’t know will of them will be other brother or sister! God bless you as you ask Father, “Tweak us, Lord!